After Flex Radio’s newest Signature series software defined radios hit the market there’s been a steady decline in value and interest in their original Flex series radios (Flex-5000, 3000, 1500). The only one still marketed is the Flex-1500, and only time will tell how much longer it will last. Flex now refers to these radios as their “legacy” series of radios and unfortunately has ceased developing software for them as well. To the best of my knowledge the Flex-1000 was their first radio and is considered first generation SDR technology as it required a soundcard interface with the computer. In spite of the excellent performance of the newest generation of SDRs on the market there still remains a dedicated core group of Flexers using their “legacy” radios. Recently I’ve found a bit of good news for those who haven’t yet jumped ship to the current offerings available from Apache Labs or Flex Radio. Darrin Kohn KE9NS has been developing an independent version of PowerSDR Ver. 2.7.2. He has an entire page on his website devoted to his Flex-5000A and all items relevant to its operation. I’ve heard rumor of one other ham doing a bit of software development, but Darrin’s is the best I’ve seen so far. His improvements have been well done and easy to implement. The upgrade is as easy as downloading the PowerSDR.exe zip file from his webpage and extracting it. Rename the PowerSDR.exe file that currently resides on your local machine to something like PowerSDRbak. You’ll also need to rename the config file as well since the latest version also upgrades the config file. Drop this new file in the same folder where your current files reside. It loads up without issues. Darrin does recommend exporting the database just in case, but I haven’t experienced any issues. The new file doesn’t change anything in the database. He has the instructions on his Flex webpage as well. This also makes all these older Flex radios on the market more of a value. Current prices are very low compared to their original purchase price. Mine was purchased in 2010 with a $100 “Dayton Discount” for $3100 which included the wide range antenna tuner, but without the second receiver. I could probably buy one better than mine for half that now. And performance is still on par with just about any current model offered by the mainstream manufactures. Sherwood Engineering still ranks the Flex-5000A in the top ten based on receiver performance. So far Flex Radio has been willing to work with independent developers like Darrin. Their source code is available, but requires an email request. In a recent correspondence with Tim Ellison W4TME, Customer Experience Manager of Flex, he directly told me that they encourage independent development of PowerSDR and see it as the primary reason many hams get involved in the hobby. I sincerely hope that’s the case as they haven’t been apologetic in saying that they are done with developing the software and compare it to the depreciation of PCs as folks upgrade every few years when they get old. 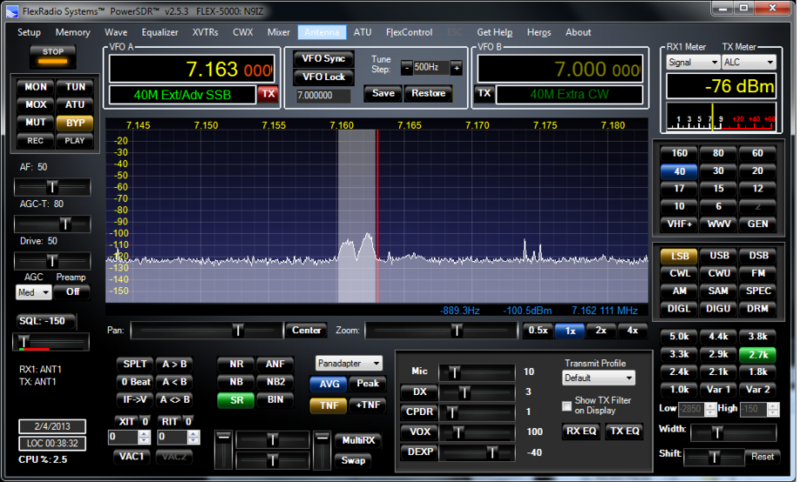 In reality, the reason I purchased an SDR in the first place was the hope that as times change, so would the software. Meaning that my radio wouldn’t be defined like the traditional knob and button rigs, but always evolving. Now I sometimes wonder if we’re just one MS Windows OS away from failure. At any rate, my station is running great on a Win 10 machine with one of Darrin’s custom versions so far. The developers at HPSDR are doing a great job with their version of PowerSDR as well. It’s actually based on older source code, but they have been able to implement some great features. Two of which are CESSB and PureSignal active pre-distortion. The CESSB cleans up the audio on the mic side of the rig and actually results in higher average power output. PureSignal cleans up the output side generating a signal with much lower IMD and harmonic suppression. Hopefully some of the features can be shared between these two. For now I’m glad that there are hams like Darrin who continue to develop PowerSDR for legacy Flex radios such as my Flex-5000A. He’s currently up to Ver. 2.7.2 R12.